George was born on 3 December 1880, the eldest child of Richard Eaton and his wife Susan (née Parker), but not the eldest child in the household – he had four elder half-siblings from Richard’s first marriage to Mary Ann Willis. These were Mary (born c1865), Harriet (1868), Emma (1869) and Arthur Richard (1872). Richard had been a widower since Mary Ann died in 1875 until he married Susan in late 1879 (a few months before George’s birth). The marriage also prompted a move from Twyford, Berkshire, George’s home village, to Newbury where Susan had been born. The move could well have been prompted by improved job prospects; by 1881 they were living in Speenhamland. Further births followed - Annie Matilda in 1882 and Florence in 1884. Richard died in 1892, aged 54. Susan, 20 years his junior, was left with three children to care for. Young George was educated, first at St John’s School in Newtown Road and then St Nicolas’ School in Enborne Road where he started in March 1889. On 19 March 1894, aged 13, he left school to work as a Gordon Boy. Gordon Boys (the name comes from General ‘Chinese’ Gordon, the hero and victim of Khartoum) were uniformed and organised on a quasi-military basis; they could be hired to run a message, deliver shopping, or anything else they were physically capable of undertaking. They were paid by the job making it a precarious existence; a number of Gordon Boys moved on to become boy soldiers (drummers, buglers, etc) before signing up for full time service when they were eighteen. By the time of the 1901 census it appears that Susan herself is ailing (she died in 1902) and the children were scattered – Annie was living with her half-sister, Emma (who had by then married George Wernham) in Woodley; Florence was boarding at a servant training home in Kennet Road, Newbury while George is not to be found. The first suspicion when a young man of George’s age is missing in 1901 is that he was abroad, serving with the army or navy, perhaps in South Africa, where the 2nd Boer War was in full spate, or with one of the many garrisons spread over the vast British Empire. A number of G Eatons received medals for service in South Africa, but there is not enough information to tell for sure if any of these were George. 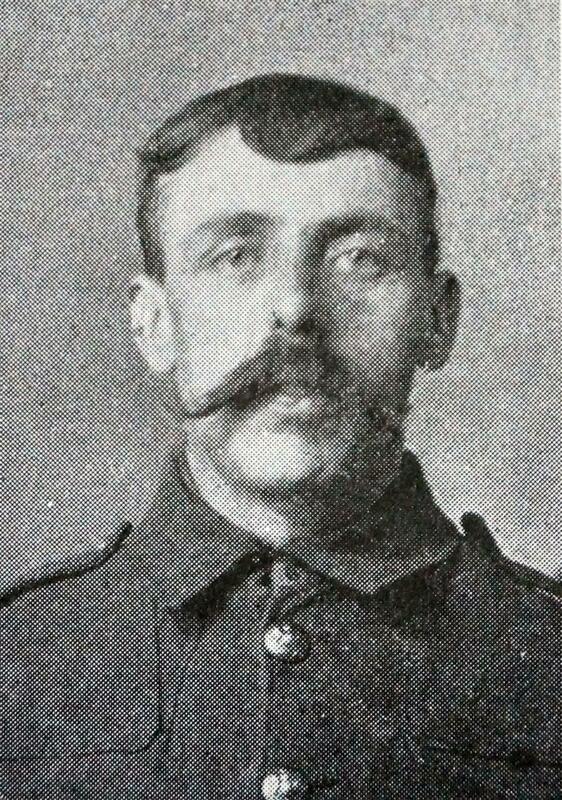 If he was in uniform in 1901 he was back in civvy street by 1906, when he married Florence Maria Collins in Newbury. This is entirely consistent with his signing up aged eighteen for the standard 12 year term of service. The first 5 or 7 of the 12 years were usually spent in uniform and the remaining years back in civilian clothes as a member of the Reserve. His seven years would have been up at the end of 1905. Jack Street, shortly before demolition in 1962. 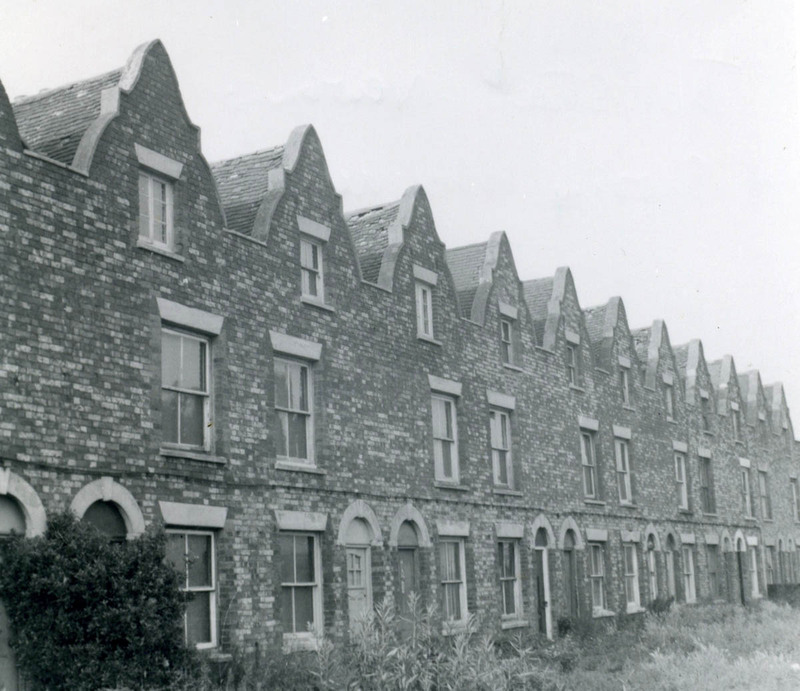 George worked for a while as a bricklayer’s labourer at the paper mills at Colthrop living at Colthrop Cottages. In 1913 the moved to 7 Jack Street (or Victoria Street as it was known at the time) with their three children: Bertram George (born 1907), Arthur Richard (1909) and Frederick Charles (1911). When war was declared with Germany the Reserve was mobilised immediately, but George’s full 12 year term would have been over by then. 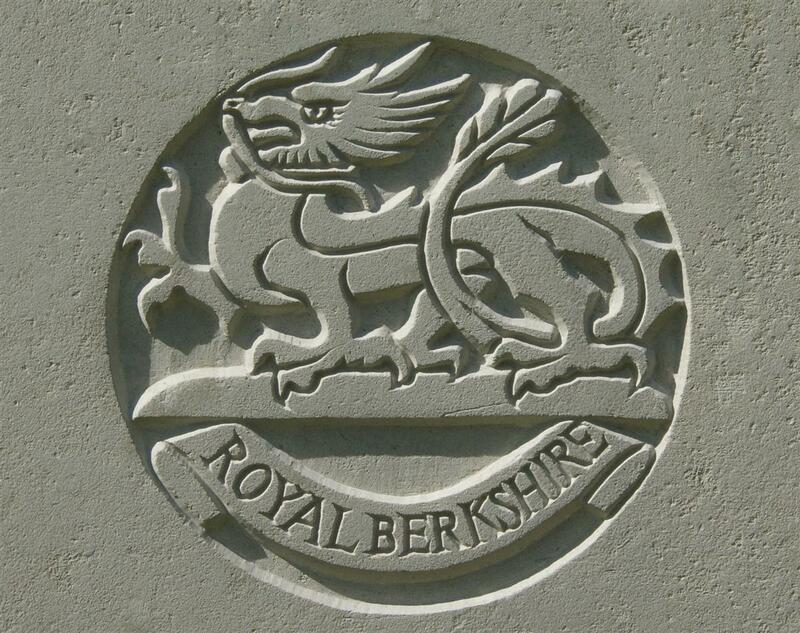 In January 1915 he decided to volunteer for service with the local infantry – the Royal Berkshire Regiment. He was posted to the 6th (Service) Battalion, a recently created battalion of Kitchener’s Army then in training at Colchester. The 6th Battalion landed in France on 26 July 1915, but George was not with it; he crossed the Channel a month later, landing, probably at Le Havre, on 3 September. The battalion had crossed to France as a part of the 53rd Brigade, 18th Division. This division was under the command of General F I (Ivor) Maxse, one of the more forward thinking commanders who served on the Western Front. For almost a year the 18th Division became accustomed to life at the front without participating in any major engagements; this would change on 1 July 1916, the date known to history as The First Day of the Somme. Ivor Maxse was convinced that the answer to the problems of attacking an entrenched enemy in this day of artillery and machine guns was good planning and thorough training. His men spent the three months before the fateful day in training for it whenever they were not fulfilling their obligations in the front line. As 1 July started the 6th Royal Berks were forming up in assembly trenches near Carnoy; by 7am all the assault troops were ready to go. At 7.28 Casino Point mine exploded and the first wave advanced into no-mans land. The first casualties were from flying debris thrown up by the exploding mine. The story of 1 July that has become synonymous with the wasted lives of the Great War is one of rows of khaki clad infantrymen rising from the trenches and walking forward into a hail of rifle and machine gun bullets accompanied by exploding shrapnel shells. This was the case with many units, but not so much with the 18th Division – the southern extent of the assault, carried out by XIII Corps (18th and 30th Divisions) and the French XXth Division was actually a success; the Germans were driven back and the Allied troops achieved their objectives. At 6.30pm the 6th Royal Berks’ war diary records Final objective reached – work of consolidation progressing satisfactorily. Supplies of arms, food, water, bombs, grenades and a flame projector brought up. So successful was the attack that even the Allies were taken by surprise; the moment had finally come when they might push into open country beyond the German lines, but they did not have enough cavalry on hand to exploit the situation. Nevertheless casualties were high, over 3,000 in the 18th Division alone. Sadly George was a casualty of this momentous day (one of almost 60,000 British and Empire troops reported killed, wounded or missing that day). He was wounded, probably fairly early in the day, and was evacuated along the well planned casualty route to No.21 Casualty Clearing Station, which was located at the hamlet of La Neuville east of Corbie, about 15 miles from the front. He died there from his wounds and was buried in grave I. A. 22 at La Neuville British Cemetery, Corbie. In loving memory of my dearest husband, Pte George Eaton, of the 6th Royal Berkshire, who died of wounds received in action July 1st, aged 35 years. In hospital in France. – From his sorrowing Wife and Children. For I loved you oh so well. Less than a year after George’s death, in early 1917, his widow, Florence, remarried to Adelbert Charles Chandler. Hopefully this was a love match; remarriage was often the best option available to a widow with young children. They lived at 5 Old Newtown Road during the early 1920s, when Florence continued to use Eaton as her surname in correspondence with the Imperial War Graves Commission. They remained in Newbury where she died in 1968, seven years after Adelbert. In loving memory of my dear husband, Pte George Eaton, Royal Berks Regt, who died of wounds in France , July 1st, 1916. From his Wife and three little sons. In loving memory of my dear brother, Pte George Eaton (Jack), Berks Regt, who died of wounds received in action on July 1st, 1916, somewhere in France. But hope in God’s good time to meet him again. From his loving sister and brother. In ever loving memory of my dear brother, Pte George Eaton (Jack), who died of wounds received in action on July 1st, 1916. Thoughts often exist when they seldom are seen. 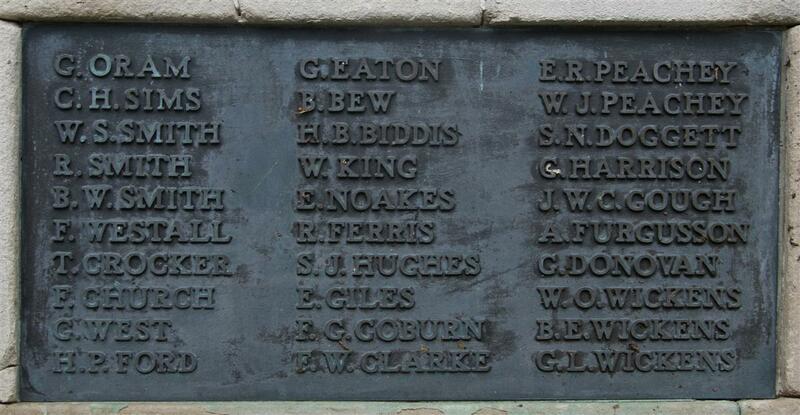 In 1922 George’s name was included on tablet 11 when the Newbury Town War Memorial was unveiled; he is also remembered on the memorial board and roll of honour in St Nicolas Church, Newbury and on the memorial to the deceased members of the Congregational Church (located in Newbury Town Hall since the closure of the United Reform Church in April 2015).